If you are using the new Common Core Standards with your young students (especially in Grade 1), then you will probably need a nice collection of 120 charts. Here is an Autumn Themed 120 Chart for students to fill in the missing numbers. I just added this document to my website! You will need to click on the picture above or the link below to go to the page where you can download this printable. If you are in need of a completely filled in 120 chart, then just click on the following link to see one I offered in a previous post. 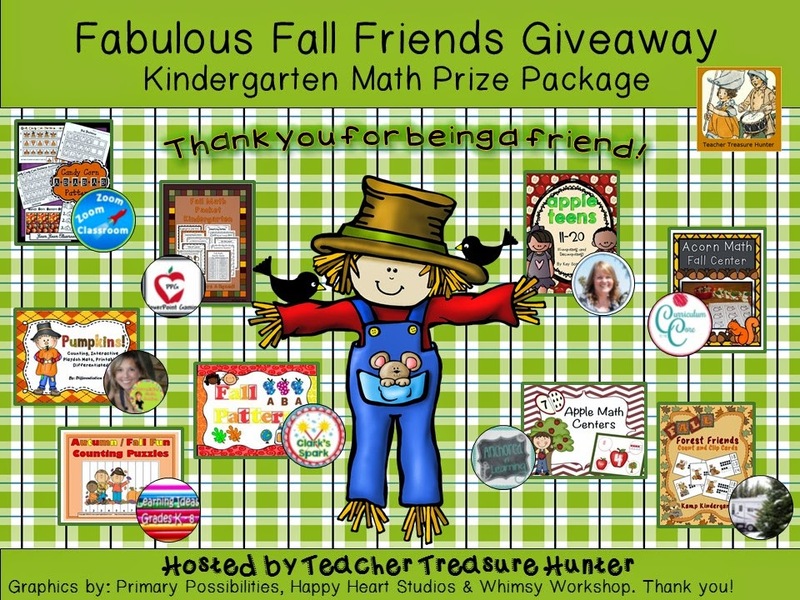 Melissa at Teacher Treasure Hunter is having an awesome giveaway or should I say several awesome giveaways at her blog. The giveaways are for Kindergarten, 1st grade, 2nd grade 3rd grade, and a combination giveaway for grades 4-5! I am donating my Autumn / Fall Fun Counting Puzzles which has 24 fun counting puzzles. Just click on the top picture to go to Melissa's blog to enter the giveaway! Best of Luck and Happy Autumn! Are your kids learning about ODD and EVEN numbers? Here's a fun Apple Coloring Worksheet for the kids. They will need some crayons or colored pencils (red and green) to complete this activity. Just click on the picture above or link below to go to my website to grab this free printable. If you'd like an odd and even worksheet with pumpkins, just click on the link below. If you'd like an odd and even worksheet with turkeys, just click on the link below. Using a number chart or number table will help students develop proficiency and observe number patterns in math. Here is an Addition Table (that I quickly whipped up yesterday) with a fun autumn or fall theme that students can complete independently or with help. After completing the table they can identify and describe lots of patterns that they see with the numbers. You can go over to my website to grab this freebie by clicking on the link below or the picture above to grab your free Fall Fun Addition Table.